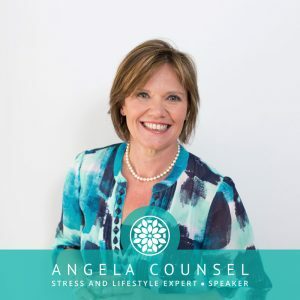 A dynamic and engaging speaker, Angela brings to the stage over 10 years of wellbeing and mind/body health knowledge, and some ‘start now’ practical business advice. Her main speaking topics are relevant and timely as women today take on more responsibility and suffer the subsequent guilt and overwhelm. Angela was excellent, she engaged our audience, motivated us with some great advice. Some of us really took on what she had to say about following your passion and doing what you enjoy. I would really recommend inviting Angela to speak at your next function and her book is fantastic. I received many emails from our members commenting on how much they enjoyed what Angela had to say. Thank you again for speaking at the Diamond club in May. We loved your ENERGY, WISDOM and most of all your PASSION & ENTHUSIASM for what you do. And must say you have handled some of the challenging questions really well on the night. Thank you very much again. We really appreciate your contribution to our Diamond club members. Angela gave her story of how she has refocussed her business to align to her values, and was able to impart the importance of making sure that our businesses reflected the authenticity of our desires and values wholistically. I particularly appreciated the points Angela made about having choices in accepting responsibility for staying true to purpose. Her focus questions challenged thinking on core goals that would direct our businesses. Angela Counsel was a recent guest speaker at our annual Gala Breakfast held for members of the North Shore Business Women’s Network. She is a brilliant speaker and had our members captivated with her enthusiasm and motivation. I just wanted to say a big ‘thank you’ for the seminar you did for our employee women’s group recently. It was fantastic to have someone speak on women’s health issues with credibility and professionalism. We thoroughly enjoyed the seminar, and learnt a lot of practical tips and information on stress management and general women’s health. My staff members also complimented you on how engaging you are as a presenter. We are definitely looking forward to having you return for another seminar in the future! Thank you so much for your talk today. I’m sure you could tell how much it resonated with the women, and how much they enjoyed it. I really appreciated you coming to Lakemba – and it was great to meet you.